villa con 2 camere in affitto per le vacanze a Nerja (San Juan de Capistrano). Controlla tutti i dettagli, le foto e le recensioni dell'immobile n° 5589. 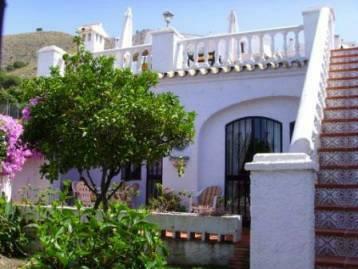 WELCOME TO "CASA DE FEELGOOD"
THE VILLA IS IN A DEVELOPMENT CALLED SAN JUAN DE CAPISTRANO. IT IS IN GOOD CONDITION. TWO BATHROOMS,(ONE EN SUITE). PRIVATE GARDEN AND ROOF TERRACE WITH FANTASTIC SEAVIEW. The highway runs in a tunnel underneath, so there is no disturbing noise from the road. Nice and new kitchen with integrated appliances. Both bathrooms are totally renovated 2017. Both bedrooms are painted 2017. New tiles at the terrace 2017. All the beds are new with high comfort mattresses, including the new sofa bed. Air condition in living room/kitchen and both bedrooms with coin meeter (1 Euro coins). Underfloor heating in bathrooms with coin meeter (1 Euro coins). very nice property, spent a lot of time on the roof terrace, came back with a lovely tan. Nerja is very nice lots of eating places, shops and also went to the beach. You will need a car as it is quite a way from the airport and town. Very nice views from the house! Peaceful area. Very friendly owner and answered allways quickly and friendly if we asked something, gave also good tips. It feels like home there; we fellt in love with the Villa. We lived also in Rincon de la Victoria and Benalmadena, but Nerja and this place were definately the best! The Villa was lovely and very comfortable. Everything you would need to make the stay comfortable The owner was very helpful with the whole booking and would recomend this villa. We have nothing but praise for this holiday home. It’s a relaxing, comfortable and beautiful home that is well cared for. Being situated 2½ kms above the old town and beach, and almost on a hillside, it has lovely views and the neighbourhood, at least in April, was quiet and orderly (with the exception of one local dog that “welcomed” people home at night). Walking downhill into town is easy and there’s an hourly bus service back up, so even without a car, access is easy. The owner was always prompt and helpful in answering our inquiries. Best suited for people who value something more than just sitting on a beach.